The Coffee4U Milk Frothing Pitcher With Integrated Thermometer give you the professional edge so you can enjoy perfectly steamed or frothed milk any time you want it. Start your day with a heavenly macchiato. Treat the kids with creamy hot cocoa. Impress friends with fancy latte art. Or just elevate your everyday with a dreamy cappuccino on a rainy evening--all in the comfort of home. No more using your hands to guess if you've reached the optimal temperature. No more struggling to hold the pitcher and a separate thermometer at time. You have complete control with the Milk Frothing Pitcher. Temperature indicators from 35-85℃. Readable, by color, in 2.5℃ increments. Great Value for Money - Click the ADD TO CART button now and order yours now!!! 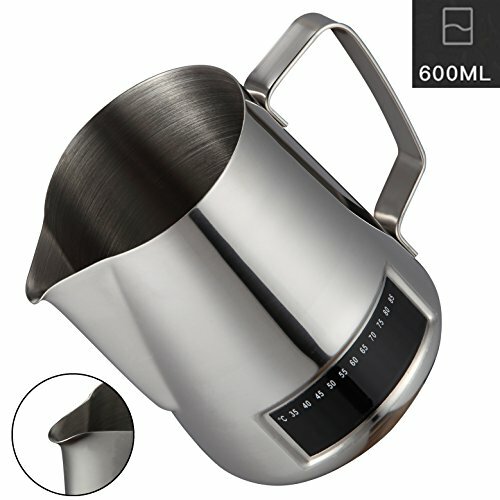 ⌛PROFESSIONAL QUALITY: The Coffee4U Milk Frothing Pitcher is made of well finished #304 stainless steel, rust-proof, stain-proof and crash-proof, heat-proof, unbreakable by daily use. ⌛ CONVENIENT: The simple design and dripless spout means no mess and perfect latte art. Very easy to wash, you can wash it under warm soapy water just in a moment;it is also dishwasher-safe..
⌛CAPACITY & MEASUREMENT: 600ml/20 oz. big volume suits 2 or 3 person, so you can use it serve your family or friends. ⌛QUALITY GUARANTEE & FRIENDLY CUSTOMER SERVICE: We have a commitment to every buyer 100% satisfaction. After all, we are customers, too, so if you have any problem about our Coffee4U milk pitcher, just contact us anytime you feel convenient.